From late June to mid Aug this home books from Sunday to Sunday. PLEASE NOTE: This home will sleep a maximum of 7 people. We can offer the home to groups of 6 ADULTS and 1 Child. We do not allow sleeping on the floor, on blow up beds, or on the furniture etc. Your group must be able to sleep in the bedding provided. 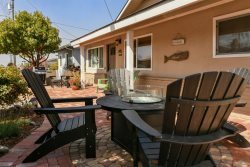 This comfortable pet friendly Cayucos beach home is only one block from the beach and conveniently located to downtown Cayucos. The furnishings will make this feel like your home away from home with comfy seating areas, indoor wood burning fireplace, and plenty of outdoor furniture. The large private patio with outdoor fireplace is the perfect spot to spend the evening after a day at the beach. Also for guest use is an outdoor shower with privacy enclosure perfect for washing off sand. Enjoy a well-stocked kitchen and all amenities you could ask for including beach chairs, boogie boards, and board games during your stay! Prime location, 1 block from the beach! Master bedroom with king size bed, flat screen tv, and attached bathroom with nicely tiled step in shower and a dual vanity. Second bedroom has a twin over full bunk bed and access to the front patio. The third bedroom includes a queen size bed and tv. The hall bath includes a combination tub and shower, shared by the 2 and 3 bedrooms. Private Outdoor Shower, perfect for rinsing off the sand when you get home from the beach. Please note, this home is part of a duplex and the upstairs unit is rented to a long term tenant. NO SMOKING. This is strictly enforced. This home will only accept 1 medium dog (under 60 pounds) or 2 small dogs (under 15 pounds). Dogs are only allowed with written approval. Please review our pet policy below. Max Occupancy: This home will sleep a maximum of 7 people. We can offer the home to groups of 6 ADULTS and 1 Child. This home will only accept 1 large dog (under 60 pounds) or 2 small dogs (under 15 pounds). Dogs are only allowed with written approval. Please review our pet policy.